ITCX Series are discontinued. As a possible substitute, please check out the ISD-TC for details. 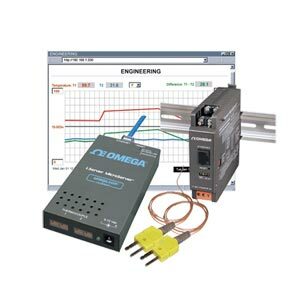 The OMEGA iTCX is simple to install and use, and features OMEGA's award-winning iServer technology that requires no special software except a Web Browser. The iTCX connects to an Ethernet Network with a standard RJ45 connector and sends data in standard TCP/IP packets. It is easily configured with a simple menu using a Web Browser and can be password protected. From within an Ethernet LAN or over the Internet, the user simply types its IP address or an easy to remember name in any Web Browser, and the iTCX serves a Web Page with the current readings. The OMEGA iTCX can send an email or text message reporting the status or an alarm condition over the Internet to any individual or distribution list. Thermocouple Lead Resistance: 100 ohm max. Software Firmware upgradeable. Including an Excel program for automatic data logging within definable time intervals, compatible with all Windows operating systems. Embedded Web Server: Serves Web pages containing real-time data and live updated chartswithin definable time intervals. Nominal Output: 9 Vdc @ 500mA, included.